The Independent and Independent on Sunday newspapers are to close next month, it has been confirmed. ESI Media has said The Independent will be a digital-only product after announcing the £24m sale of the i newspaper to regional publisher Johnston Press. The regional publisher said in a statement it “has conditionally agreed to acquire the business and certain assets of i” for £24m. In an email to staff, ESI Media owner Evgeny Lebedev described the move as “an historic transition”. Lebedev said a “significant number of employees” would move to Johnston Press but that a “number of employees” will be made redundant. The move will see 25 “new content roles” created, a new subscription app launched and new editorial bureaux in Europe, the Middle East and Asia, Lebedev told staff. He also said more investment would be made in the United States. Lebedev also revealed the ii’s website, i100, would be renamed indy100.com. Johnston Press said it would be launching inews.co.uk. The last edition of The Independent, he said, will be published on 26 March and The Independent on Sunday on 20 March. i editor Oliver Duff said journalism from The Independent will continue to feature in his newspaper, as well as content from ESI Media’s Evening Standard and Johnston Press’s regional titles. “Today the Independent titles announce an historic transition. At a time when our journalism is read and respected by more people in more places than ever before, we are embracing an exclusively digital future with http://www.independent.co.uk and its associated sites. “We faced a choice: manage the continued decline of print, or convert the digital foundation we’ve built into a sustainable, profitable future. In choosing the latter, we will create 25 new content roles, launch a new subscription mobile App, enhance the redesigned, thriving http://independent.co.uk, open new editorial bureaux in Europe, the Middle East and Asia, and invest further in our New York based US operation. “We will re-name the hugely successful i100 site as http://indy100.com. “I can now confirm we are selling The Independent’s sister paper, i, to Johnston Press, subject to Johnston Press shareholder approval. “In addition, we will cease to print The Independent and Independent on Sunday. The Independent’s last edition is expected to be on Saturday 26th March and the last Independent on Sunday is expected be on Sunday 20th March, enabling us to focus our collective energy on the digital Independent. “I believe this is the right decision at the right time for the world’s most free-thinking newsbrand. This transition follows rapid digital growth in the past three years that has made http://independent.co.uk the UK’s fastest-growing quality newspaper site. Its monthly audience has grown 33.3% in the last 12 months to nearly 70 million pointing towards a fast growing global footprint. “We will be the first of many leading newspapers to embrace a wholly digital future. All of us are immensely proud of the Independent titles, which are better newspapers now than they have been for many years, thanks to your remarkable creativity, work ethic and passion. “But UK print newspaper market conditions mean this change is inevitable. “The planned sale to Johnston Press ensures that i will continue to flourish. Johnston Press will be commendable owners of this great, innovative newspaper, whose success has defied industry predictions, and which was named National Newspaper of the Year last year. “We expect a significant number of employees to move across to Johnston Press under the Transfer of Undertakings (Protection of Employment) Regulations, known as TUPE. A number of employees at Independent Print Limited will be made redundant. “I regret this, but can confirm that all those on employment contracts and long term casuals who are being made redundant will receive two weeks’ pay, subject to conditions, for every year worked, plus your notice period. “The Independent will now offer advertisers access to the world’s largest commercial platform for truly independent journalism. “My family bought and invested heavily in the titles because we believe strongly in its values. “Its journalism has set the agenda for nearly three decades, with world-class writing, reporting and analysis. “Over the past six years alone we have launched a sister title that now outsells The Guardian, grown http://independent.co.uk to nearly 70 million global users a month, and won countless awards for our unique contribution to news and culture, with values of bravery, compassion, scepticism and wit to the fore. Founded in 1986, The Independent is the UK’s first daily national newspaper to close since 1995, when Today was folded (not including the News of the World, which closed in 2011 but was then replaced by the Sun on Sunday). The Independent on Sunday was launched in 1990. 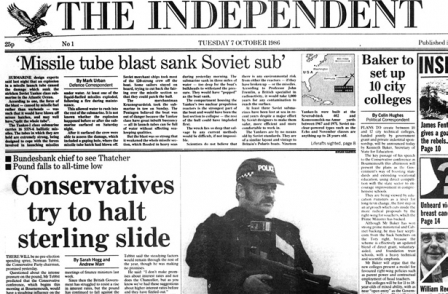 The Independent’s peak circulation, recorded in November 1989, was 421,829. 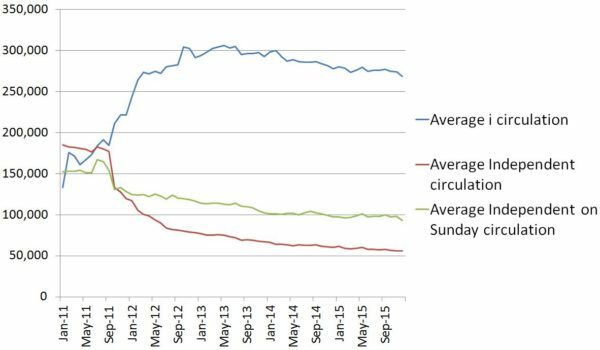 In December, according to ABC, The Independent’s circulation had dropped to 56,074, a figure which included 15,356 bulk copies, in December 2015. The Independent on Sunday’s circulation was 92,914, including 49,861 bulks. In October 2010, at the launch of the i, The Independent’s circulation was 182,412, including 63,990 bulks, and the Sunday edition’s was 154,367, including 53,170 bulks. During this period, from October 2010 to December 2015, The Independent’s cover price increased from £1 to £1.60 and the Sunday edition’s from £1.80 to £2.20. Over the same period, the i’s cover weekday cover price has risen from 20p to 40p. It introduced a Saturday edition, costing 30p, in 2011. This now costs 50p. In December last year, the i’s circulation was 268,431, including 67,750 bulks. This was up from 133,472, including 7,770 bulks, in January 2011, when its ABC records started. Over the same period, The Independent’s website ABC figures – boosted now by the i100 website also – have soared from an average 560,686 daily unique users in January 2011 to 2,796,267 in December 2015. Yesterday, confirming “late stage discussions” with ESI Media over the sale of the i for £24m, Johnston Press revealed the title recorded an unadited “carve-out” operating profit of £5.2m in the year to September 2015. Independent Print Limited, the company which comprises the three newspapers, recorded a loss of £4.6m in the year to September 2014. In the year to September 2011, its first full year under Lebedev control, this figure was £22.6m. It attributed the improved performance – the loss was also down from £12.3m in the year to September 2013 – ESI Media noted a “sharp rise in revenues” from the i newspaper. In a statement today, Johnston Press chief executive Ashley Highfield said: “This is a transformational acquisition for Johnston Press and an important step towards delivering our long-term strategy. “i is a highly regarded newspaper with a clear market position and a loyal readership. By joining with Johnston Press the combined circulation will be equal to 9% of national daily circulation, making us the fourth largest player in the market. “This enhanced reach represents a significant growth opportunity for Johnston Press in terms of national print and digital advertising revenue. It also rebalances our revenues towards less volatile circulation revenues. In an ESI Media press release, Evgeny Lebedev said: “The newspaper industry is changing, and that change is being driven by readers. “They’re showing us that the future is digital. “This decision preserves the Independent brand and allows us to continue to invest in the high quality editorial content that is attracting more and more readers to our online platforms. “The Independent has always been a pioneering newspaper with a track record of innovation. “It has a proud heritage as Britain’s first truly independent national quality title. And chief executive Steve Auckland said: “The unique editorial proposition of The Independent is perfectly suited to the global digital landscape. “Following this decisive move to digital, we will be as focused and uncompromised as any start-up, but with all the authority and trust of an established newsbrand – a truly unique proposition. “We now have a clear and secure future path for our businesses.